During her tour of the Egyptian Museum UNESCO Director General Irina Bokova "praised the physical actions Egypt's youth took in attempts protect the museum from looters during the revolution" says Nevine El-Aref ('UNESCO director general tours the Egytian Museum', Al-Ahram Tuesday 14 Jun 2011). Bokova [...] applauded the Egyptian youth for forming a human shield to protect the Egyptian Museum and the Library of Alexandria. 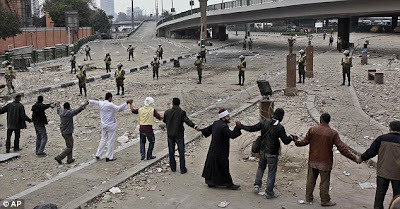 at no time did the protestors in Tahrir square storm the museum or loot its contents, in fact the people tried their best to protect the museum even forming a human chain around the site. However, all the archaeological sites in the country were protected by Egyptian people of all ages; I am especially proud of the young Egyptians who formed a line around the Egyptian Museum, Cairo, to protect it from outlaws and further break-ins. He has since returned to this as a leitmotif, the Egyptian people protecting their heritage. We've all heard about it, I even wrote about it at the time. When I was in Cairo just after the revolution I met a young man (an air conditioning installer) who insisted he'd formed part of it. It's a beautiful story. But to what extent is it true? And what do we know about it? Here's the photo usually used to illustrate the story. ... but checking this one out it shows events a few days after the Museum looting and shows protesters trying to prevent the removal of a barricade, so nothing to do with the epic human chain to protect the Museum. Let us take another look at the first photo. My first thought is these guys do not look much like protesters that have spent the night under the stars in the square. Yet if we are to believe that this is the famed human chain, that is what they should be. The photo is clearly taken in the morning, but the morning of the 29th, because there - large as life in the background is an army tank. 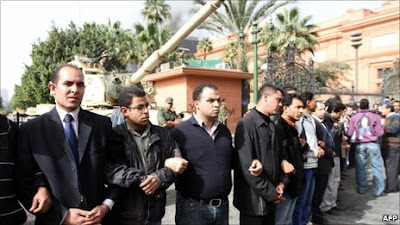 The human chain, the story goes was set up to protect the museum from looting before the army got there. But here is a nice lineup of gentlemen after the army moved in (Also don't these guys look rather more like security men than students? They can't be though because they were all withdrawn the night before - so we are told). It looks posed doesn't it? Even more interesting is where they are standing. Its the short red line on the picture below. So this line is blocking the end of the street, a street actually already occupied by the army. But that is not what the story is, is it? The eastern wall is on the right of the picture below, along the street, here it is both a wall and cast iron railings. The gift shop is the L-shaped complex of structures in the middle, built up against the museum's western boundary wall which divides it from the (then burning) NDP headquarters. So to stop them jumping over the wall, where was this human chain? Right around the museum? Did it also prevent people from getting into the abandoned NDP compound and jumping over the wall dividing it from the museum? Or did the human chain just enclose the Museum, leaving the west side open? I wonder whether the north wall was also breached, when I visited the Museum in February, workmen were busy cutting down the trees that grew against the wall on the north side (you can see them on Google earth) which made me wonder whether they had been used by looters of the shop to get into the museum grounds, some had branches hanging over the wall, a totally obvious security risk that had obviously gone unrectified for years. Though I was sad to see the trees go, the townscape here is incredibly bleak. Or is "forming a human chain around the site" just a figure of speech? Are either of these green lines a realistic reflection of what happened on 28th January outside the gates, fence and wall of the Egyptian Museum? The longer line is about a kilometre in length. If there were that many people involved, there must be loads of photos they took with cell phones etc. recording their part in this heroic action. Where are they? Why is a Google search only turning up one photo (the same photo, which looks posed) taken the day after? I'd be glad to post up here (with proper acknowledgement) any photos readers who were there can send me of this human chain (or links to where we might find them). Or is the "human chain" just a convenient myth - helping to assuage consciences about what REALLY happened inside the Museum that night? Also one report has "a thousand people" running around the courtyard (garden) that night, while Nigel Hetherington appears to be saying that the protesters did no such thing. What is the truth, what really happened?